Northwest and Northeast Vietnam are among tourist attractions for breathtakingly beautiful rice terraces. Rice terraces having appeared in Northern mountain region for hundreds of years are built by competent hands of the Dao, the H’Mong, the Ha Nhi, the Tay, and the Xa Pho and more, from a generation to the next one continuously. 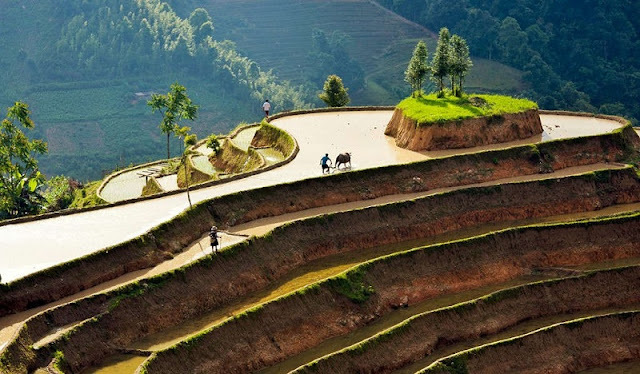 Rice terraces in Northern are slopes claimed from nature for cultivation in hilly or mountainous areas. Due to the steep feature, fertile soil thanks to it was created by weathered granite rock and mountain cliffs often stock water, local ethnic minority people can grow rice and establish terraced rice fields, one after another, from the foot to nearly top of mountains. In May each year in May, Northern mountain region again became more beautiful and wild than ever. Water poured from the stairs of the field to another stairs of the field, immense color mixed in the soil will be mixed with the color of blue sky above, reflecting to create a picture of nature with wonderful colors. Here are the 4 best places to see the Northern terraces in water season. Every June when the rainy season comes to the northern mountain provinces, the terraced fields in Hang Su Phi are full of water from the mountain sides and streams which look like giant natural mirrors. It is the time for the ethnic people to start a new and their only rice crop of the year. For years, the ethnic people from generation to generation have made great efforts to reclaim land for creating such magnificent and beautiful terraced fields stretching on the mountains. When the first downpours of the summer drop heavily and the sun are not very burning is also when the terraced fields in Mu Cang Chai are sparkling in the gorgeous color. This land is most beautiful in May- June when the terraces are in water season, and in September- October when a bright yellow of ripe rice spreads the fertile plots of land. they are also the two periods when Yen Bai welcome crowded of visitors including the photographers who come here to “hunt” the most unique and beautiful photos. Always the preferred choice of foreign visitors when visiting the North-west. Visitors can admire the beautiful terraced fields in water season in the countryside of Ta Van, Ta Phin, Hau Thao, Trung Chai, and Lao Chai. At the end of May and early June when the summer rains cool down the northwest region, the Mong ethnic groups in Sa Pa in Lao Cai province are busy with new crop seasons. Terraced fields there are soaked with water, making them an incredible sight for visitors. The curving lines of the terraces embrace the chambers of water glittering fields, reflecting the sun and clouds, creating the magical, magical effect of Y Ty in the summer. 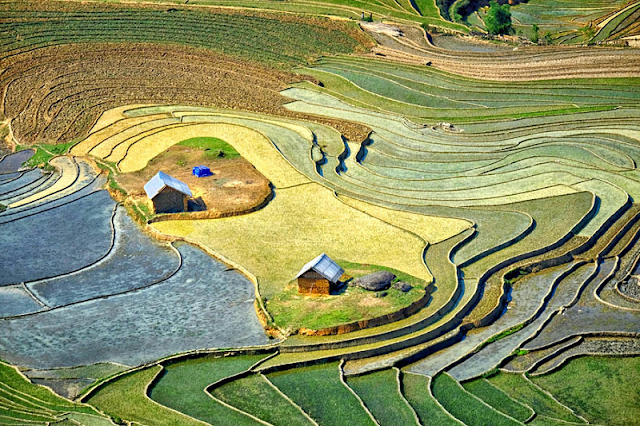 On every occasion in the last month of May, when the rainy season starts, the terraced fields are glittering like the mirrors in the sky, creating a very attractive beauty for tourists inside and outside the country when coming to Y Ty (Bat Xat ) in Lao Cai province.